Looking for a delightful slaw—slightly different—for a holiday potluck or feast? Look no farther! The Food section of the Washington Post recently included a yummy recipe for what I’ll call “Holiday Slaw.” Unlike most slaws, this one is served at room temperature or even warm. But it’s “holiday” because it contains chopped dried cranberries and crystallized ginger. I have a reason for calling this yummy dish “Holiday Slaw” and not the name printed in the Post. The reason is that the basic ingredient is Brussels sprouts, a veggie many people love to hate. 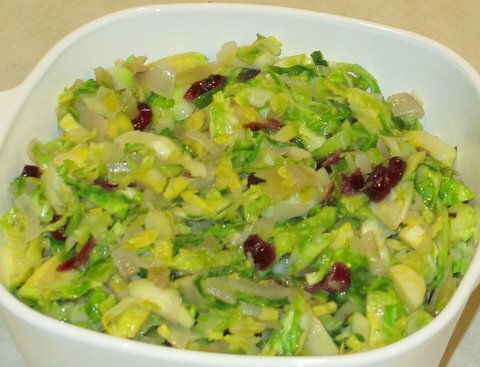 On Saturday we visited Bill & Noelene, friends who also had seen the Post recipe and asked us to contribute this dish to their dinner: “Shredded Brussels Sprouts with Cranberries and Ginger.” The dish was a hit. We’ll be making it again. It replaces roasted Brussels sprouts as our favorite sprouts recipe. I salivate as I recommend it to you for holiday feasting—while fresh sprouts are available in the stores. 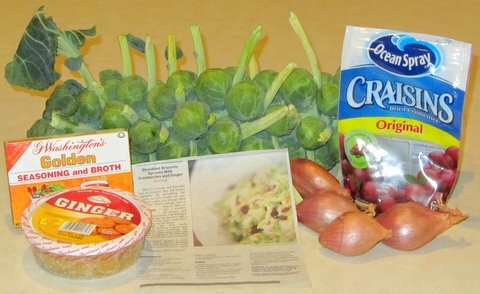 I found it more economical to buy the sprouts by the stalk—with the spouts on the stalk equaling about four and a half 10-ounce tubs of sprouts—and in far better condition. We’ll make two dishes out of sprouts from one stalk. If this recipe has a downside, it’s that it’s labor intensive—shredding those small sprouts. I do it manually, which takes a half hour or so, but perhaps you have some new-fangled machine that would reduce that job to a minute or two. To go to the Post recipe, CLICK HERE. Ha ha, I like your inviting name. We could do a Victoria's Secret Cobbler with Victoria rhubarb, too. For a really different but delicious slaw, try http://simplyrecipes.com/recipes/winter_root_vegetable_slaw/ – I made it instead with carrots, celeriac, Jerusalem artichokes and beets because that's what I had on hand. The beets made it pink but it was tasty and fresh. That root slaw recipe looks inviting. I'll have to check it out and store it for future use. Thanks for sharing. I just brought this dish to a potluck yesterday, fully expecting to return home with leftovers. Hah! The bowl was scraped clean to the bottom — a culinary success!